This book, published by The Shelley Group on the occasion of their 25th Anniversary, covers the history and production of the Wileman and Shelley factory from its early beginnings until its closure in 1966. 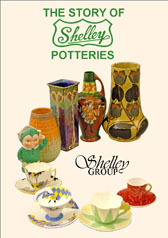 The book is profusely illustrated in colour and gives a fund of information for collectors and enthusiasts everywhere. The book, which contains 72 pages of information and pictures is approximately 147 x 210 mm (5¾ x 8¼ inches) in size.